But, the Sadhak should fully understand that using the Sadhna for bad or harmful purposes means that he should be prepared to face the likely side-effects. 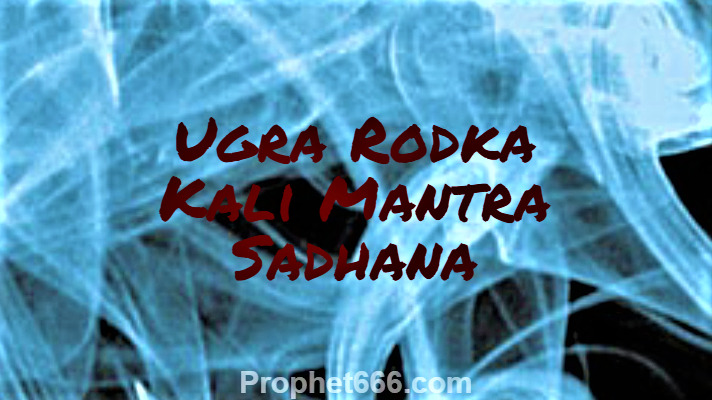 So today, I have shared a Rodka Kali Mantra Sadhna, which is a difficult and Ugra Sadhna, Hence, only advanced Sadhaks should practice this Sadhana and if other Sadhaks want to practice it they can do it with their Guru. The procedure given below is normally followed in order to practice this Ugra Rodka Kali Sadhna. 1] Practice this Sadhna in a Shamshan near a river. 2] Practice the Sadhna for 21 days. 3] Chant 1 Mala of the Mantra given below daily. 4] Offer meat, liquor and flour peda daily and while returning to your home after the Sadhna do Visarjan of all these 3 items in the river. Note- The Rodka Kali Roop of the Divine Mother is said to be a most fearsome form of Kali Mantra and if anything goes wrong, the Sadhak, even if he is an advanced and experienced Sadhak could loose his life. It is also a Tamas Guni Mantra Sadhna because it is practiced in a Samshan Bhoomi and makes the uses of Tamsik items, like meat and liquor. रोड़का काली का यह शाबर मन्त्र है ,जो अच्छे और बुरे दोनों कामो के लिए प्रयोग में लाया जाता है .मन्त्र साधना के लिए आवश्यक है कि श्मशान घाट के पास,जहां नदी बहती हो ,वहाँ नदी किनारे बैठकर जप किया जाय .प्रतिदिन मांस,मद्य और आटे का पेड़ा नैवेद्य में रहे ,जिसे आते समय प्रवाहित कर दिया जाय . २१ दिन की साधना के बाद सफलता अवश्यम्भावी है .